How much downtime will you face this year due to poor battery management of your lift truck fleet? Every minute your forklift trucks sit idle, you lose money. That’s why, no matter what the size of your operation, it pays to reduce your forklift battery maintenance downtime. At Sackett Systems, Inc. we specialize in developing faster, safer, more efficient ways to keep your forklift fleet rolling seamlessly from one battery change out to the next. Hydra-Handlers: Match your battery lifter needs with our single, double, triple, quad and 5-high stacker systems. Sackett introduced hydraulic battery transfer controls to the industry to eliminate the hazards of overhead and manual lifting. Our exclusive vacuum cup extraction system adjusts to irregular battery surfaces so each battery moves seamlessly from forklift truck to rack and back. Most importantly, your operator never has to touch the battery during transfer, safely controlling all moves from the control room or allowing the Centurion Elite to handle it automatically. 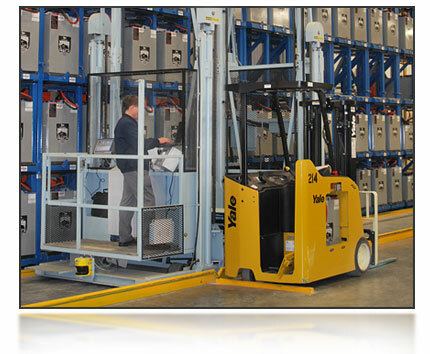 Northstar System: You’ll be hard pressed to find a faster, more efficient way to manage your forklift batteries. This fully integrated, automatic battery management system extracts and replaces batteries in less than a minute. Stores batteries up to 10 high for a smaller, more efficient footprint. Transfer Carts (4,000 LB Capacity | 5,000 LB Capacity) : If you’re operating a fleet of 10 forklift trucks or fewer, Sackett Systems pallet jack-mounted and fork-mounted transfer carts offer time- and money-saving battery handling options. Choose models with 3000- or 5000-lb. capacity, and features including manual or hydraulic power, vacuum-cup extraction or magnetic extraction. Powered Traveling “A” Frame: There’s no need to invest in an expensive bridge crane or jib crane. This track-mounted, hydraulic-powered “A” frame safely and easily transfers batteries from your forklift truck to the designated battery docking station. Battery Charging Stands: Choose from single- and multi-stack models designed specifically for use with your transfer cart, Hydra-Handler, “A” frame, bridge or jib crane. Automatic Battery Washer: Get more usable life from your batteries. This washer comes with our unique neutralizing cycle that reduces (even eliminates) terminal and cable corrosion, as well as dirt and trash build-up on the battery tops. Ground Support Equipment: Here’s an easy way to move your equipment efficiently and safely. Choose from flatbed or covered baggage-cart models. 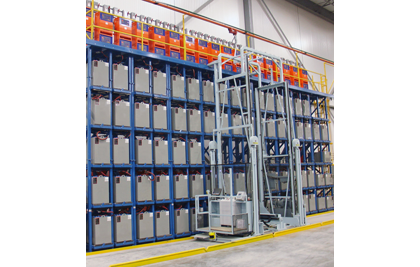 Unsure which Sackett battery exchange system or equipment will deliver the best results for your operation? Talk to us about your productivity goals and we’ll show you ways with our new and certified, pre-owned equipment to achieve the efficiencies and cost-savings you need to compete. Once installed, Sackett Systems equipment will perform with a dependability you can count on for years. And you can turn to us whenever you have questions or need replacement parts. Our highly trained service staff responds fast because we know how important it is to keep your forklift fleet rolling. 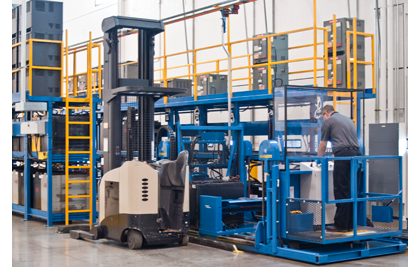 Ready to eliminate downtime and run a more efficient forklift fleet? Sackett Systems is ready to help. Contact us today for the forklift battery exchange system you need to make money in this economy.